Do I need to add a connection field to both of the objects I want to connect together? No, you only need one connection field. Adding a connection field to both objects can confuse things in your live application. Which object should I add the connection to? For one-to-many connections, it generally works best to add the connection to the many, or "child" object. For many-to-many, add the connection to the object that you want to select the connected record from in the Live App. For example, you may have a many-many relationship between Projects and Managers. Which record do you want to edit to connect to the other record? If you want to be able to add Managers to Projects from the Project details page, add the connection field to the Projects object. See this article about connection types for more details. Do I need to track unique ID or key fields? No, Knack manages all the connections behind the scenes without needing key or ID fields. If I delete a parent record will all the connected child records also be deleted? No, the child records will not be deleted. How do I delete a connection? My connection field shows as undefined. A record in one object is connected, but the connection field shows "Undefined" instead of the connected record. To fix this, go to the settings tab of your connected object, in the Data section of the Builder. Change the Display Field, save, and change the Display Field back to what you want. You will now see the connected record display properly in the original object. How can I change what field from my connection object displays in the connection field? You can customize what field from a connected object shows in a connection field via the display field. How can I display multiple fields from one object in a connection field? What if I need many connection fields between the same two objects? I get an error message when I try to add the second connection field. On rare occasions, you may need multiple connection fields between two objects. When you do this, you will receive a caution message before adding the second connection. You can click OK and continue adding the connection. Please keep in mind that outside of the limited cases mentioned below, we rarely encourage double connections! Livestock: You want to track the mother and father of a horse or other animal. In this case, you can add two connection fields from Animal back to Animal. The first connection field is called Father, the second connection field is called Mother. Students: You want to track two Guardians for each Student. From the Student object, add two connection fields to the Guardian object, renaming them Guardian 1 and Guardian 2. Document or Project Roles: You want to track which user from the Employees user role submits, approves, and manages each Project. 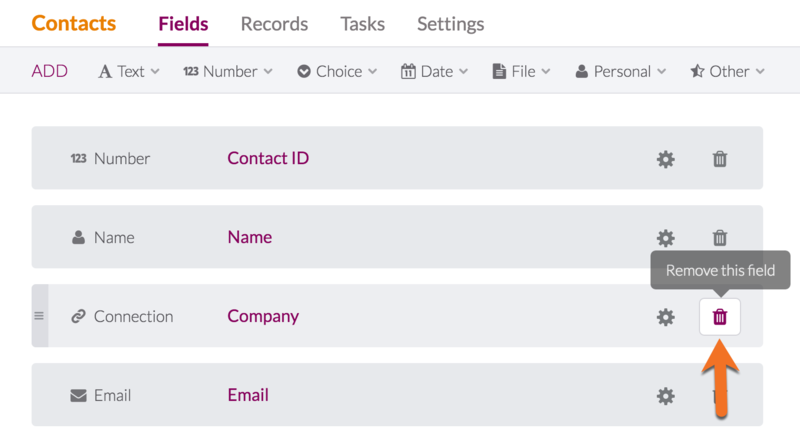 From the Project object, add three connection fields to the Employees user role, renaming them Submitter, Approver, and Manager. The Warehouse Manager example listed in our Complex Example article. If you’re still unsure, please reach out to us at support@knack.com. How do I see what type of connection I have?